The paper presents the results of microstructural studies as a comparative quantitative analysis of sample microsections produced of 110G13L steel grade and hardened by the static-pulsed treatment. The research was done at the central laboratory of «Murom Switch Works». The grain size is determined in accordance with GOST 5639-82 standard values. A quantitative assessment of sample microstructure characteristics depending on the static-pulsed mode hardening is presented. Microstructure grain size dynamics on the sample hardened surface depth is considered. Microstructural study confirming theoretical hypotheses within the surface hardening mechanism development by means of the surface-plastic technique is performed. Structural changes mechanism in the samples produced of HMS in static-pulsed treatment is studied. The research proves that the reason for hardening is austenite grain fragmentation into smaller blocks and grain twinning. Keywords: microstructure, grain size, heavy-loaded surface static-pulse treatment, surface hardening, durability, depth of the hardened layer. Kirichek A.V., Kokoreva O.G., Lazutkin A.G., Soloviev D.L. Static-pulse treatment and equipment for its implementation // STIN, 1999, № 6. – P. 20-24. Smelyanskiy V.M. Mechanical hardening of surface plastic deformation. – Moscow: Mashinostroenie, 2002. – 300 p.
Lazutkin A.G., Kokoreva O.G. Strengthening and shaping surfaces static-pulse processing // Precision technology and transport systems: Proceeding of the Internetional scientific and engineering Conference – Penza, 1998. Part 2. – P. 124-126. Kokoreva O.G. Technological opportunities static-pulse processing // Engineering technique, 2001, № 2. – P. 12-15. Kirichek A.V., Soloviev D.L., Lazutkin A.G. Technology and equipment to static-width surface treatment of plastic deformation. – Moscow: Mashinostroenie, 2004. 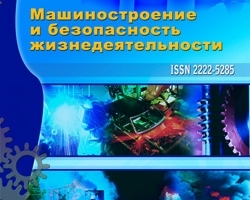 Kokoreva O.G., Metallographic study results in static-pulsed hardening of heavy duty machine parts surfaces, №4 (18) 2013, Shlapak L.S.